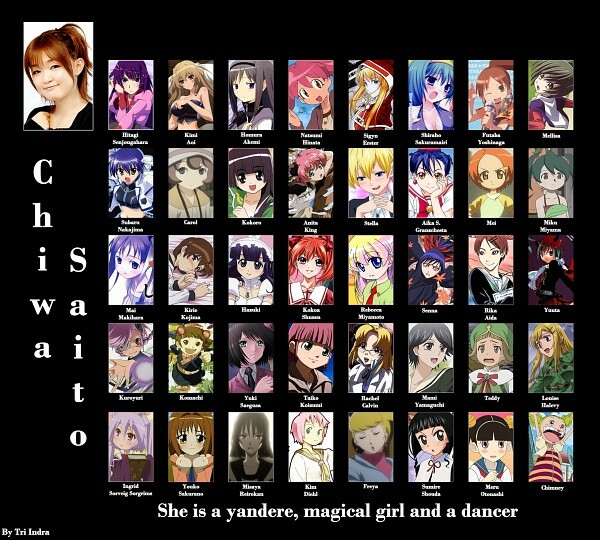 Chiwa Saitō (斎藤 千和 Saitō Chiwa, born March 12, 1981 in Saitama) is a Japanese voice actress employed by I'm Enterprise. Saitō is one half of the voice acting duo "coopee", along with Natsuko Kuwatani. In the "Divine Design" arc of the Getbackers drama CDs, she voices a character who battles the character voiced by Kuwatani. She is a member of the voice acting group "MORE PEACH SUMMER SNOW", alongside Haruna Ikezawa, Mamiko Noto and Ryo Hirohashi. The group began as "MORE PEACH SUMMER", with Ikezawa, Saitō and Noto; all four voiced characters in the Keroro Gunso anime. The quartet's name is based on the names of their respective Sgt. Frog characters: Angol Mois (Noto), Momoka Nishizawa (Ikezawa), Natsumi Hinata (Saitō), and Koyuki Azumaya (Hirohashi).